i'll admit, i suffer from inbox overload - i sign up for lots of emails...mostly to look at layouts and keep up with emerging trends, but to also find fodder for my blog. the issue with this email is that both the subject line and headline say that the e-hookah pen is $8... but the text within the email, under the picture says that it is $6. for what it's worth, 73% off the normal retail of $29.99 is indeed closer to the $8 price than it is the $6. 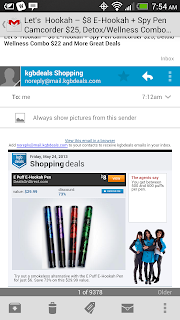 this was a typo - or probably what happened is that the vendor provided content and kgbdeals just floats the content into their templates based on purchased placement and so forth, so benefit of the doubt falls on the content providers, but either they or kgbdeals failed to proof their content. what's so bad about this? in the grand scheme of things, nothing - especially not worth producing an "oops email" - because the correct price is quoted in the subject line and in the headline text, but there are probably a few people in customer service who are fielding calls and emails, wanting to know if they [the customer] can get it for the $6 price. when i used to work retail, if a price was mismarked, we had to honor the lowest price, if not because it was the right thing to do, but to keep arguments at the register to a minimum. luckily in a brick and mortar retail environment, you can go pull the inventory off the rack and re-price them accordingly, but in this electronic world...we don't have that ability. this could impact the bottom line, not just for the vendor, but also for kgbdeals. not only from a contract point of view, kgbdeals probably sold this based on opens or impressions - most likely paid in full - but if they make a deal to accept the price of $6, then kgbdeals could be left holding the bag, having to pay the vendor $2 for each item sold. and to make matters even worse if this a typo on their [kgbdeals] fault, then they'll may have to deliver the dreaded "make-good", which is running the ad again, for the same number of impressions, in the same position for free. not only does this result in a freebie and lost ad revenue, but it could cost man-hours in that kgbdeals may have to juggle production schedules and sales reps have to make calls and renegotiate the contract. so what looks like a small little typo could blow up to cost big bucks in not only lost revenue but also in man-hours. the moral here is the more sets of eyes on a document, the better and to always keep documentation, because if this situation is indeed the submitted creative from the client the argument for not paying the difference and for not having to deliver a make-good are easier to make.